Turkey's Kurds are being subjected to what HDP leader Selahattin Demirtaş called a pre-election "lynching campaign." The Turkish Republic will hold new parliamentary elections for the second time this year on November 1, following the failure of the Islamist Justice and Development Party (AKP) of President Recep Tayyip Erdoğan to maintain a legislative majority. Ballots cast on June 7 reduced the AKP's share of seats to 258 out of 550, the party's first loss of control over the governing body since 2002. In addition, a new force, the People's Democratic Party (HDP), mainly comprising Turkish Kurds, won 80 seats in June. The traditional secularist Republican People's Party (CHP) gained 132, and the ultra-right Nationalist Movement Party (MHP) also elected 80 deputies. Attempts to create a multiparty governing coalition - focused on the AKP and CHP - failed. But Turkish and Kurdish critics of Erdoğan argued from the beginning of the political crisis in June that the president had no desire to resolve the situation and would gamble on a new vote to provide AKP with a renewed majority. Such an attitude fits the authoritarian style of Erdoğan. One must admit that Erdoğan has a magnificent capacity for judging the mood of the public. He is a gifted speaker, who could convey, after 13 years in power, that he was merely a modest servant of the poor Turks - or, put better said, that he could mediate between all of the country's citizens. But his credibility was destroyed by a single statement. Erdoğan is calling the June election results a "mistake" that the Turkish people must now "correct." That came when Erdoğan called the result of the June election a "mistake" the Turks had to "correct" by a new vote. The hero of the majority party, rushing from election victory to election victory, the father of a "new Turkey," could not contend with the failure of the majority of voters to continue following him. That would have to be an error, which the Turkish citizenry could not desire. Without his political assurance of the love of the Turkish nation, Erdoğan now wishes to force their affection for him. He also reveals that for him, Turkish democratic electoral rules are less important than his personal power. Erdoğan has set a series of fires that will not be easy to put out. Ankara is ablaze because the long-ruling AKP has been undermined. The Kurdistan Workers Party (PKK) agitates for greater concessions than those proposed previously. The Kurdish militants want enhanced autonomy or regional self-determination. The so-called "Islamic State" (ISIS), driven by fanaticism, treats anyone who does not follow its puristic vision of Islam as an enemy. Turkey has become a battleground of all against all: AKP vs. the Kurds, the MHP against the left, Kurds fighting ISIS, and ISIS opposed to everybody. A ceasefire between the Turkish authorities and the PKK, which was agreed to in 2013, broke down. Kurdish-identified workplaces and businesses in Turkey have been attacked repeatedly. The pro-Kurdish HDP and Kurds in general have been the greater victims in this tumult, at least in numbers. HDP branches and other Kurdish-identified workplaces and businesses have been attacked repeatedly. 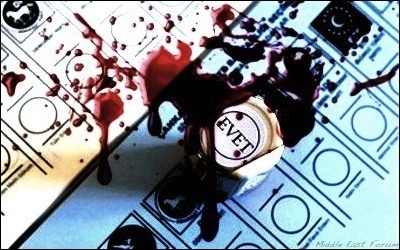 In the broader Turkish context the secularist newspaper Hürriyet's offices were assaulted twice. Early in September, as reported in the London Financial Times, HDP leader Selahattin Demirtaş counted 400 Kurdish sites as having been targeted for what he described as a "lynching campaign." Then came the explosion on October 10 of two bombs at a rally for peace between the Turkish state and the Kurdish minority, in Ankara, the national capital. The death toll stood at 102 people, with 400 more injured, according to Hürriyet. The Ankara atrocities followed a blast in Suruç, a town in southeast Turkey, on July 20, in which 33 people were killed and 104 injured. Suruç is close to the Turkish-Syrian border and the victims in the July horror were leftist activists who organized to rebuild the Syrian Kurdish town of Kobane, liberated from ISIS control at the beginning of this year. The Turkish government has blamed both the Suruç and Ankara bombings on two Kurdish brothers affiliated with ISIS. But Kurdish and other opposition representatives reproach Erdoğan and his cohort for failure to assure security in the country. Kurds make up at least 18 percent of the population of Turkey, which stands at a total of 80 million, as estimated in the CIA World Factbook. They are also prominent in the Turkish diaspora communities of Western Europe, especially in Germany. As Turkey approaches its "substitute" parliamentary election for this year, two more factors come into play. With the country acting as a major transit point for Syrian and other refugees headed for northern Europe, the European Union (EU), which had suspended its process for accession of Turkey, has indicated that it would reopen the mechanism for Turkish membership if the country accepts a new role in controlling Europe's borders. German chancellor Angela Merkel visited Istanbul on October 19, and proposed that EU financial aid to Turkey, along with visa restrictions and talks on EU affiliation, be reopened. Further, the large body of heterodox Shia Alevi Muslims among Turks and Kurds - also counting around 20 percent of the population - are fearful of a reassertion of AKP power. David Gardner of the Financial Times stated on November 14 that 84 of 132 deputies for the Republican People's Party (CHP) are Alevis (a sect unrelated to the "Alawites" under Bashar Al-Assad in Syria). Alevis claim with considerable justice that they have experienced long-standing discrimination at the hands of Turkish Sunni rulers, both secular and Islamist. They were reminded of their grievances by the Ashura commemoration on October 24, which recalled the martyrdom of Imam Husayn, the grandson of Muhammad and heroic martyr of Shiism, at the battle of Karbala, in Iraq in 680 CE. Like the tragedy of Karbala, Erdoğan's march to new elections is paved with blood and intrigues, as well as the suffering of the Syrian victims of official Turkey's passivity toward ISIS recruitment and passage across the frontiers between the two countries. Stephen Schwartz is executive director of the Center for Islamic Pluralism in Washington, DC, and a fellow at the Middle East Forum. Veli Sirin is European director of the Center for Islamic Pluralism.